A firefighter who ‘always tried to please everyone’ had not been wearing his seat belt when his car came off the road on the way to attend an emergency call. Paul Keenor, of Maypole Road, Ashurst Wood, left the Maypole Inn where he had been enjoying an evening with friends and family to head to Forest Row fire station. But the 23-year-old died when his Toyota Celica collided with a wall on Wall Hill Road on August 1. 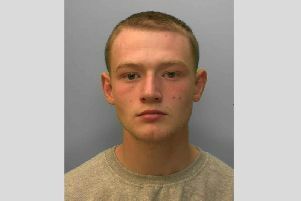 An inquest in to his death was held on February 2, at Parkside in Horsham. Graham Keenor paid tribute to his son – a keen sportsman and father of two –who had set up his own building company in addition to joining the fire service. He was a distinguished swimmer, competing on behalf of clubs in Crawley and East Grinstead. “He was such a lovely lad. He was brilliant,” Mr Keenor told the inquest. Mr Keenor said he told his son to ‘take care’ when he left the pub. A post mortem confirmed Mr Keenor died of multiple injuries. PC Rowland Watmore, crash investigations officer at Sussex Police, said he believed Mr Keenor had been travelling at around 40 mph hour when his car left the road. He said it was most likley Mr Keenor may have lost control because of ‘excessive speed or harsh steering’. His seat belt had not been worn. Dr David Skipp, assistant coroner for West Sussex said it was important’ for Mr Keenor’s friends and family to remember Paul as someone who would do anything to help anyone. “He did answer his pager that day,” he said. Mr Skipp concluded Mr Keenor died as a result of a road traffic collision.